Bhí mí an-ghnóthach ag Roinn na Gaeilge agus ag an gCoiste Gaelbhratach chun an Ghaeilge a chur chun cinn sna ranganna agus ar fud na scoile. D’eagraíomar a lán imeachtaí i rith an Mhárta chun an Ghaeilge a spreagadh agus a chéiliúradh timpeall na scoile – comórtas postaer agus céilí don chéad bhliain, tráth na gceist don dara bliain, céilí don tríú bliain, gearrscannán agus céilí don Idirbhliain agus comórtas amhránaíochta agus céilí don chúigiú bliain. Comghairdeas do rang Ms Sheehy a bhuaigh an comórtas amhránaíochta! Beidh damhsathon ar siúl ag an tríú bliain agus an séú bliain an tseachtain seo chugainn!! Taobh amuigh de na ranganna, d’eagraíomar dhá imeacht móra – Aimsigh an Gadaí agus an Crannchur Mór. Chuala na daltaí noda ar an gcallaire gach lá faoi mhúinteoir áirithe agus ag deireadh na seachtaine, scríobh siad síos na hainmneacha agus chuir siad isteach ar an gcomórtas. Bhuaigh na buaiteoirí uibheacha Cásca! Chomh maith leis sin, beidh An Crannchur Mór ar siúl againn ag deireadh na míosa. Faigheann na daltaí ticéad má dhéanann siad iarracht an Ghaeilge a labhairt timpeall na scoile agus lena múinteoirí go léir. Tá an-iarracht á dhéanamh ag na daltaí agus ag na múinteoirí! Beidh buaiteoir ó gach bliain agus beirt bhuaiteoirí ón bhfoireann scoile chomh maith! The Irish department and Gaelbhratach committee have been very busy promoting Irish in class and all over the school. We organised a lot of activities during March to encourage and celebrate Irish around the school – poster competition and céilí for first years, quiz for second years, céilí for third years, short movie and céilí for TYs and a song contest and céilí for fifth years. 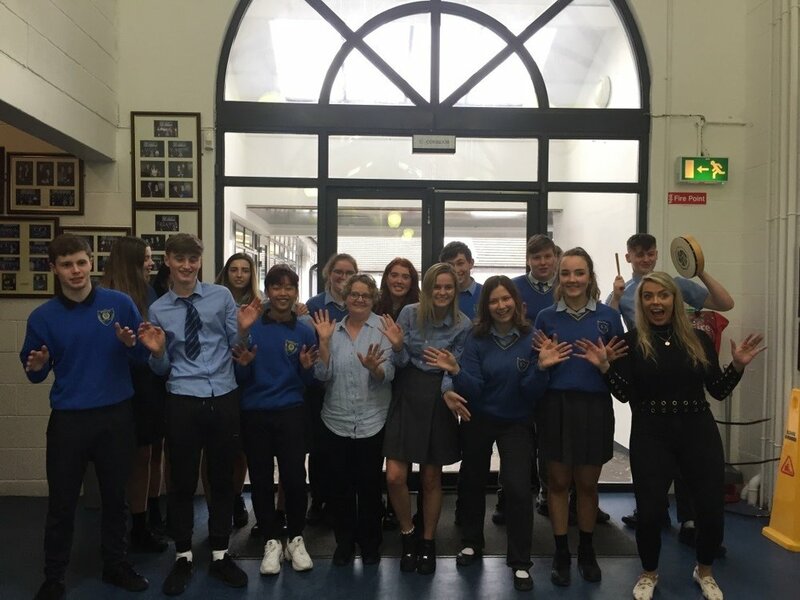 Congrats to Ms Sheehy’s fifth year class who won the song contest. There will be a damhsathon for third and sixth year students next week!! Outside of classes, we have organised two big activities – “Find the robber” and “The big raffle”/ The students heard clues on the intercom everyday about a particular teacher / member of staff and at the end of the week, they wrote down the names and they entered into the competition. 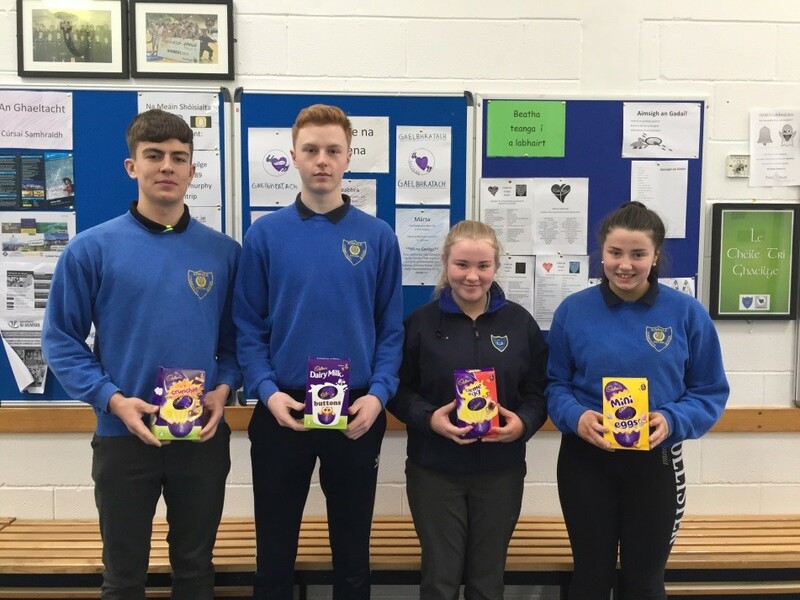 The winners won Easter eggs! As well as that, there will be the big raffle taking place at the end of the month. Students get tickets for the raffle if they make an effort to speak Irish around the school and with all their teachers. Both students and teachers are making a big effort!! There will be a winner from each year group and two winners from the staff also!